Recent release “Doodle Art” from Page Publishing author Jerry Fudge is an engrossing book that lets users do coloring that is good for their emotional well-being with controlled doodles that are generally symmetrical in design and uncontrolled ones with no particular design. 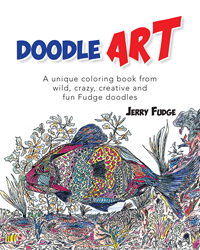 Jerry Fudge, a retired health care administrator in the Navy who has went back to college to get an art degree and started a pottery and sculpture studio before going back to doodling, has completed his new book “Doodle Art”: an exciting coloring book that encourages people to use colors with an unrestricted mind and just enjoy. Published by New York City-based Page Publishing, Jerry Fudge’s new book is an amazing and remarkable work that gives people the freedom to color each doodle the way they like and add their own doodles or drawings to the blank spaces. The doodles that he has finished are also on the cover. Readers who wish to experience this enlightening work can purchase “Doodle Art” at bookstores everywhere, or online at the Apple iTunes store, Amazon, Google Play, or Barnes and Noble.